MEOUG Majlis is an Oracle Technology Forum for the Middle East Oracle Users Community. 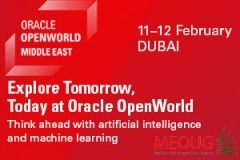 As an educational Forum, MEOUG Majlis 2013 benefits users of the full stack of Oracle technology products to gain better value from their Oracle investments. Develop your network of contacts by interacting with Oracle customers, System Integrators, Consultants, developers and representatives from Oracle Corporation. The MEOUG is the shared “voice” for Oracle Users and provides an essential source of information for all Oracle professionals. MEOUG – Connecting the Oracle Users Community! Join MEOUG and Majlis 2013 to Connect, Communicate & Collaborate how innovation can be achieved without complexity. Come learn from the experts how to simplify your IT investment by putting the latest technologies into practice to drive your business performance. Step-2 Go to events and select MEOUG Majlis 2013 event. Payment in full must be received at time of check-in for admittance into the Majlis event. Onsite payments of only cash, company checks will be accepted. Individuals who have attended the last MEOUG Majlis are eligible for an Alumni Discount of AED 100 per person. MEOUG is offering a discount of AED 100 per person on groups of three (3) or more registrations from the same member company. MEOUG is offering a discount of AED 100 per person for Middle East Government Institutions. MEOUG is offering a discount of 75% per person for students of Middle East Universities/Colleges. Students can register with only AED 100 per person. For verification purposes, valid student number and institution verification will be required. For more information on all discount offers, or to take advantage of these offers, please contact the MEOUG Team via e-mail at registration@meoug.com prior to registering. MEOUG Majlis 13 is an exceptionally unique event in Middle East Oracle user group conferences. One reason is our signature Community Service, where we as volunteers give back to the society. MEOUG in partnership with ‘Manzil’ …a destination, a home, a hope, for a day of community service along with Majlis. Manzil cultivate a highly professional care giving and learning environment for individuals with special needs, enabling them to explore their potential to the fullest. AED 10 will go to Manzil donation from each MEOUG Majlis attendee’s conference fee. Another way to give back is to make a donation to Manzil. No donation is too small! Companies or individuals donating more than AED500 will have their names or logo placed on MEOUG Portal. To become an MEOUG Majlis Community Service Sponsor, please send email to registration@meoug.com to donate today. Add this social service onto your action-packed 2 days of Oracle technology sessions. You won't regret it! Cancellations of registration must be received in writing no later than 20March 2013 and are eligible for a full refund less a AED 100 processing fee. At all times, however, substitute delegates are welcome upon written advice to the MEOUG Conference Committee.Please send your notice to registration@meoug.com. All information is correct at time of publishing. The MEOUG Majlis conference organisers reserve the right to change speakers, events and/or session times, dates, prices and other details as necessary. At all times, delegates and their guests are responsible for their own conduct, actions and consequences. Learn how the Oracle Fusion Applications can fit into your company’s strategy. Hear from Middle East customer early adopters, Oracle technology experts, and consultants who are actively involved in Oracle Fusion Applications implementations. Oracle’s Fusion Applications experts will describe the Fusion Applications coexistence strategy and how to move forward with your own company’s investment. Oracle Development team will explore this release, covering the new skills your technical staff will need to learn, how the new WebLogic Server is different from the current 10.1.3 Oracle home in Oracle R12.1.3. Get answers to your questions about how and when to fit Release 12.2 into your company’s E-Business Suite roadmap. EPM/BI will focus on the accounting, finance and internal audit teams at your company to provide up-to-date information, an understanding of application roadmaps and practical solutions to better leverage your current and prospective investments across all of the Oracle BI applications and tools. Daily challenges of maintaining a high performance database and you have to be sure the data is available 24×7 and compatible with other systems. MEOUG Majlis provides DBAs of every experience level and industry with the tools to productively and creatively administer data. High performance is key, but software and hardware conflicts can sap your speed. It’s time to consider Engineered Systems and take advantage of a pre-integrated solution with power. Learn how to optimize your database performance, decrease your time to production and reduce your overall costs with the family of Oracle products. An Oracle topic or area of concern that you want to debate in an open forum. Cliff Godwin is the Senior Vice President of Applications Development at Oracle Corporation. Mr. Godwin is responsible for the Oracle E-Business Suite and Higher Education businesses. Mr. Godwin has been a member of the senior management team of Oracle’s Applications business for most of his 19 years at Oracle. Mr. Godwin holds M.S. degrees in Mathematics and Operations Research from Stanford University, and an M.B.A. from Harvard Business School. Nadia is a Senior Director of Applications Development at Oracle Corporation, with cross suite responsibility; go to market initiatives, and customer success activities. Nadia joined Oracle 23 years ago and her main objective is to help customers understand the value that each release of the Oracle E-Business Suite brings to them, to help customers understand the value that the technology brings to the Enterprise Applications in general and to the Oracle E-Business Suite in particular. In this role, Nadia spends lots of time working with the Oracle User Groups such as OAUG and covering events (i.e. Oracle OpenWorld, Collaborate, OAUG Connection Points worldwide etc…). Nadia also gives lots of advice on how Oracle E-Business Suite customers can prepare their upgrade to the next releases with some best practices learnt internally as well as externally from our Applications ecosystem. Nadia is a three-time recipient of the Oracle Applications User Group 'Ambassador of the Year' Award (2007, 2009, 2010), and received the Oracle Applications User Group Lifetime Service Award in 2011. Nadia has also received the UK Oracle User Group (UKOUG) Inspiring Speaker Award (for UKOUG 2011 Conference). Nadia is the holder of a PhD in Computer Science from England. Kristophe Hermans is a Senior Proactive Support Manager and brings 20 years + experience in the service industries build up at Oracle and IBM. He worked as a support engineer and delivery manager before joining the Oracle Proactive Support Movement. Session: "The New Reality of Service and Support". What is Oracle Support Services' answer to this Challenge? Customers want and expect more from their support providers. Customers are asking themselves; what's the value for my support contract. A lot of investment has been done by Oracle Support services to make the My Oracle support Portal richer, more useful, customer friendly, intuitive. Including how can customers really embrace 'proactive elements' using the Get Proactive Portfolio. We'll share with you what we in Oracle Support have developed, with the help of our Customers, to give you the 'Best Service Experience' in the Industry. Wesam Lootah currently holds the position of Assistant Director–General at the Dubai eGovernment Department. A committed and talented Emirati, Wesam has more than 14 years of experience in strategic leadership positions where he has leveraged Information Technology to create innovative channels and eGovernment infrastructure to better the quality of public services for citizens, residents, visitors and businesses in Dubai. Prior to that, he was Director, Information Technology at Emaar Properties. During his time at Emaar, Wesam led the global rollout of sales automation and ERP across Emaar subsidiaries. This included countries such as Pakistan, Egypt, Saudi Arabia and Canada. Wesam is not new to Dubai eGovernment as he was previously Head of Application Services from 2002 to 2007. During that time Wesam led the implementation of unified business process and ERP across Dubai Government entities. Wesam holds a Master’s degree in Computer science and engineering from Pennsylvania State University and a Bachelor’s degree from Ohio State University. Wesam is also an author with published research in Computer Security. Dubai eGovernment has successfully upgraded the GRP (Government Resource Planning) to the R12 version of the Oracle E-Business Suite on 29th October, 2012 with a 2 and half day of downtime, and after 5 full test upgrade cycles. Strong project sponsorship, fully knowledgeable IT team, and high level of communication with all stakeholders, during all project phases resulted in the project success.